There's lots of challenges floating around in blogland these days! This week the Critter Sketch Challenge Blog is stepping away from a sketch, this weeks theme is Flowers and a color combination of Blue, Orange and Yellow. As you can see I got a little creative here, using the colors along with the flower, instead of using the colors as my card stock. This card also uses Kristen's Going Grey Challenge, if you love Basic Grey, Kristen's Challenges are all using Basic Grey Papers. 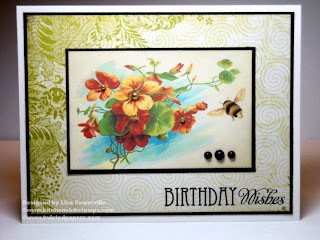 The beautiful floral image is from Twisted Papers, and just happens to have the right color needed for the Critter Challenge. I just love the oldtime vintage feel. The image was printed on Vanilla card stock, I added some Distress Ink in Old Paper to age the paper a bit. I repeated the aged look on the Origins Basic Grey paper used for the panel under the image. The sentiment if from Kitchen Sink Stamps Simple Sentiment. To finish off the card I added some Basic Grey Ivory Pearls to a few of the flower centers, and some Black Pearls to fill the open space. Don't forget if your a TJNL Member Twisted Papers is a TJ Vendor - use your discount code to shop! Beautiful card, I just love the fabulous colors! Wow! I love this card. Great job! Thanks for joining the Going Grey challenge!! I am luvin' that card! Image just popped off the page! Lisa, this is gorgeous, love how it turned out!!! Thanks for joining us on our challenge, I really need to use somethings other than stamps on my projects-yours turned out beautiful! This is so gorgeous! I love the flowers and the colors are "mwah"! Lisa, Your card is GORGEOUS!!!! Girl, you have been making some Seriously GORGEOUS cards....Thank for Playing in our first Going Grey challenge!!!! WOW this is BEAUTIFUL, LOVE this image and papers!!! Thanks so much for joining us at Going Grey with Scrapcreations!!! I love this card. The image is gorgeous.